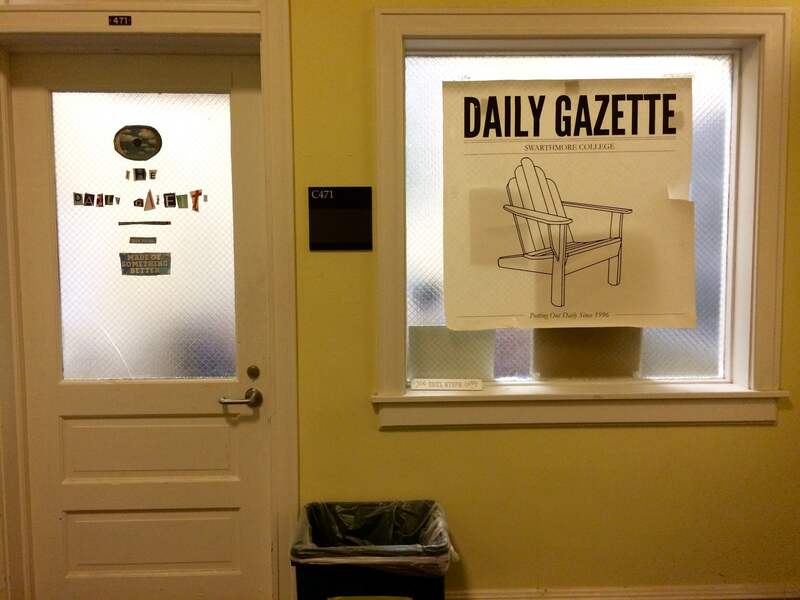 As the former editor of the opinions section for the previous three semesters, I would like to respond to the controversy regarding Erin Jenson’s recent article The Admissions Office Doesn’t Care About Your Values and explain why I think The Daily Gazette (DG) was right to publish the article. I view the opinions section as a voice for the members of the Swarthmore community. 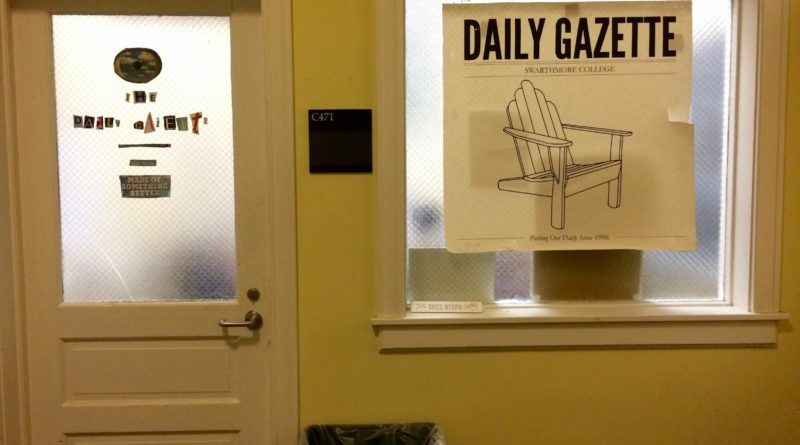 The DG is not trying to publish pieces on the level of The New York Times or The Atlantic, but rather it is trying to give a platform for students and groups to speak their minds. Those voices will say very different things (including things we may find truly abhorrent as a community), but the DG’s role is not to censor or discriminate in which opinions are published and which are not. I don’t know Erin personally, but it seems to me that she very deliberately takes an antagonistic tone at times that undermines rather than helps her argument. I understand how many in the community were offended by her comments about students on financial aid in particular. However, I do not think offensiveness should be a litmus test for denying publication of an article. It is important to know that Erin’s views are held by at least one (and I suspect more than one) member of the community, and I have seen a number of thoughtful critiques of her argument. In this way, the publication of the piece has done a service to the community, as I believe it is better for these issues to be discussed in the open rather than fester in private. Thus, I strongly disagree with the decision of the Editorial Board to essentially denounce Erin’s piece. I have worked with Eduard, Brandon, Patrick, and the rest of the EdBoard, and I think very highly of all of them as people and as editors. But the irony of the title “We fucked up” is that the DG fucked up precisely in backtracking on the article, in what appears to be a decision driven in part by negative public opinion towards the piece and the DG. The views expressed in the piece are Erin’s and hers alone, and she – not the DG – must bear ethical responsibility for them. I found her argument to be incoherent and factually lacking and her follow ups on Facebook to be entirely insufficient, and this is perhaps the best grounds on which the DG can apologize. I would have liked to edit it more thoroughly in order to clarify and substantiate the main points before publication, but this does not warrant a retraction once the piece has been published. While the piece may not be up to the paper’s standards, the way in which the DG threw Erin under the bus by claiming a piece that they signed off on exhibits “self-satisfied and insidious classism,” seems quite unprofessional to me (even if it may be true). While there has been some constructive criticism on social media, the vast majority of comments have been incredibly cruel. Denunciation on social media and in the comments section is a fear that every opinions author has, and I worry that it will discourage people from dissenting from the status quo of Swarthmore’s politics (a status quo from which I also dissent vehemently, although in a very different way than Erin does). On a more human level, writing a piece is a very personal undertaking, and despite strongly disagreeing with the sentiment and logic of her piece, I can’t help but feel sympathy for Erin in light of the ad hominem attacks she has received. Even if she was not particularly kind in the article, two wrongs do not make a right, and some of the attacks on her appearance, family, and personality are undoubtedly wrong. In the meantime, I hope that Erin, the DG, and the Swarthmore community can take a step back to learn, reflect, and improve from what has been a terrible situation for everyone involved so such an event can be averted in the future. Featured image courtesy of The Daily Gazette. Arjun, thank you for this thoughtful letter. As co-editor in chief, I had a central role in the writing of the “We Fucked Up” letter, and I stand by the fact of the apology. I think it was necessary regardless of the backlash to the original op-ed. 1. I would have contacted the writer before we published the apology, explaining why we thought it was necessary. 2. I would have argued for the toning down the parts where the apology letter criticizes the original op-ed. As commenters have pointed out, criticisms of the article and its writer had already been made numerous times in often mean-spirited ways. A simple “The contents of the article made it unfit for publication” would have sufficed, rather than quoting at length from the article and trying to dissect it. These are changes I could very easily have pushed through if I had considered them at the time, so I take full responsibility for my own failure to sufficiently consider how the apology letter treated the writer. While I disagree that the apology was driven by the public backlash, I know that the severity of the backlash definitely clouded my judgement and added an element of time pressure. If we’d taken more time to deliberate, we would’ve done a better job. To reiterate: I think the apology was necessary, if flawed. Our biggest failure remains the publication of the original article. Let alone its intentionally inflammatory nature, the article was incredibly poorly written and largely devoid of any meaningful content or coherent argument. Sure, the DG is not the New York Times as you hyperbolize, but what’s the point of having an editorial board that doesn’t, y’know, edit? Any publication that cares about its writers should not allow one to release something so predictably embarrassing. It’s okay to ask for rewrites. In Arjun’s defense, he argued for essentially what you ask for. As a former Editor-in-Chief, I would have liked to have seen this op-ed edited to remove the insults against a class group. No op-ed should have so much vitriol or so many logical gaps. (Nor should it have the wrong “its”: “it’s socioeconomic diversity” instead of “its socioeconomic diversity”). I think there is a scenario in which a well-reasoned article written against redistributive financial aid could have been produced and published in the Gazette. Ideally, it would have been accompanied by a well-reasoned article written in favor of redistributive financial aid. And we all know which side would have won, because this is Swarthmore, and because helping low-income students attend college is a just cause. But raising the issue in order to force both sides to stop, think, and sharpen their arguments, could have been valuable. In any case the Ed Board has quite clearly apologized for not editing. I trust them to stick to their promise going forward. Thanks for writing this piece, Arjun. I do not agree with Erin’s opinion. I think that the editors should have done a better job of having her edit the piece for publication. At the same time, I believe very strongly in the value of free speech and I thought that the DG’s rationale for retracting the piece was flimsy. It’s also, yeah, pretty damn cruel and unprofessional of DG to take part in a social dog-pile that’s already consumed Erin’s social media pages. If DG staff members disagree with her, they should take it up with her privately rather than invoking the authority of a campus newspaper to denounce her in front of everyone. The failure to edit the article is what’s apology-worthy. It wasn’t just mean– its facts were flat-out wrong, the argument made no sense, and it read like an edgy teenage diary entry. The DG SHOULD have apologized for that, and I was glad to see it addressed. The retraction, not so much.